I am a firm believer in sitting on the couch and relaxing. I've never been very good at exercising. Never. And now that I have a baby... whew. I know I'm not alone. That being said, I'm also a firm believer in leggings and if I'm going to show off some leg I'd like those legs to be at least a little fit. 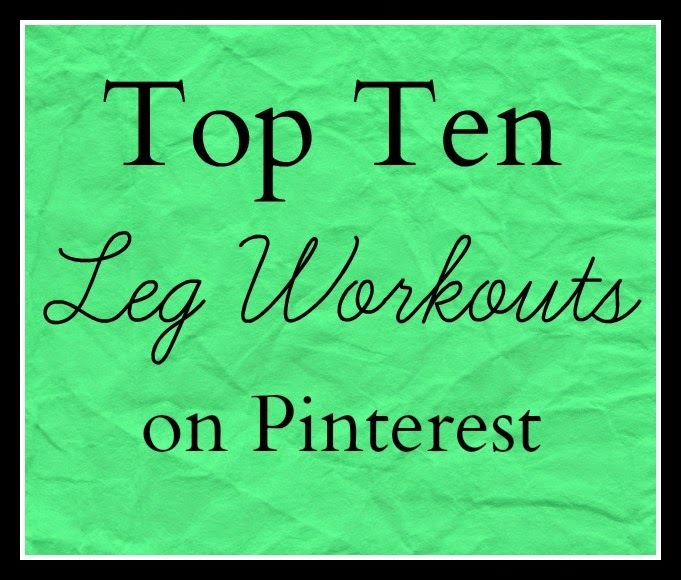 So I went through my Pinterest boards and I pulled together all my favorite leg workouts. I've tried them all at least once... wouldn't it be great if you only had to workout like once a week and your body would be perfect? I could completely handle once a week if I thought I'd see results. Anyway... Try these! Tell me what you think. 1. This ballet-inspired workout is one of my favorites. I've never taken ballet, but I've been obsessed with it since I was little. My sister and I used to check out library books that would teach us ballet moves and practice in the living room. This workout is phenomenal. I managed to do this one regularly for two weeks and my legs started getting some definition and my posture improved. It really works out your core, too. Love it. 2. This is another ballet-inspired workout that I've tried. I like this one less because it doesn't have pictures and I struggle to learn something without first seeing it done. 3. This leg workout targets your inner thighs. Better yet, it takes TEN minutes and there's a video. I love that in the video you can tell the instructor is a little out of breath. It makes me feel better about gasping oxygen into my body from my floor. 4. Anything that says Victoria Secret on it is almost guaranteed to be my cup of tea. I love this VS workout. They have an entire string of videos that could keep you going for weeks. 5. Similarly, this NFL Cheerleader workout is workout motivation and workout combined. It's not specifically focused on your legs, but it sure does work 'em and I was sore. 6. This workout targets your love handles. Very good for showing off your leggings. I had no idea how out of shape my lower body was until I tried this workout. Oi... how sad. 7. I love workouts that can be printed and posted. This one is fantastic for a quick workout between running after children. 8. This leg workout takes a little longer than five minutes, at least for me, but its still perfect. 9. This workout is only 3 moves. If I'm going to commit to a workout, I like for it to be longer, but these moves would be perfect to combine with #8. 10. Lastly, I'm posting another ballet workout. There's a reason all those dancers have gorgeous legs. I hope at least one or two of these workouts tickles your fancy. My current favorites are #1 and #5. Let me know how you do. Maybe someday I'll do a challenge and we can all workout together.